The story of VHF radio beacon GB3VHF began in the 1950’s - a period, now fading from memory, when the world was recovering from a succession of world wars and was coping with the resultant political tensions between East and West – the “Cold War” period. Despite obvious divisions, moves toward mutual scientific advancement were becoming widely supported towards the end of the decade: one notable initiative was the instigation of International Geophysical Year (IGY) which ran from 1st July 1957 to 31st December 1958. The IGY covered a diverse range of earth science disciplines and was focused on gaining a better understanding of the earth’s physical properties and manifestations, along with the atmospheric and solar phenomena that impacted on everyone’s lives. Much was achieved in what turned out to be an “18 month” year: the IGY itself may now be long forgotten, but it was during IGY that several notable events and discoveries were made – the best known probably being the dawn of space flight with Russia’s launch of the Sputnik 1 satellite and the discovery of the earth’s tectonic plates. Of particular interest to radio amateurs, the IGY was also instrumental in the birth of radio beacon GB3VHF or as it was formerly known GB3IGY. Part of the IGY interest was focused on radio propagation and the atmospheric and solar interactions that impacted on radio transmissions – this was particularly so for the very high frequencies (VHF) that would later be adopted for everyday FM broadcast purposes. In the true spirit of gathering basic scientific observations and data, radio amateurs and listeners were well placed to play a vital role in this period of discovery. Instigated by radio amateur Ken Ellis, G5KW, the Radio Society of Great Britain (RSGB) promoted the deployment of a radio beacon for propagation studies as part of the IGY activities – the beacon was to be given the callsign GB3IGY in recognition of IGY. The beacon was licensed in 1957 and set up on behalf of the RSGB at G5KW’s home at Well Hill in Kent (500 foot above sea level) , 15 miles S.E. of central London. Initially licensed at 1kW on 145.500 MHz, the beacon was finally up and running in March 1958 using a 300W valve driven transmitter linked to a North pointing 6 over 6 element J-Beam slot fed Yagi antenna at 30ft. Morse code was initially generated using an automatic punched tape keying machine - this however proved troublesome and was soon replaced within months with an electro-mechanical transistorized light disk keyer. The transmitter was also replaced at the same time with an ex-radar transmitter running 25W on the basis of reliability outweighing brute power. As the IGY ran its course GB3IGY initially transmitted for five minute periods every one and half hours from 6pm till midnight unless carrying special IGY “Alerts “or “Special World Intervals” that were notifications of high solar activity. Information on Sputnik 1 was also included with some transmissions. With higher reliability of keyer and transmitter, transmission periods were extended for longer and longer periods with continuous operation being the norm by 1959. As IGY drew to a close and the world-wide solar notifications ceased, GB3IGY continued to transmit continuously until the end of March 1959 transmitting 45 seconds of “CQ DE GB3IGY” interspaced with 15 seconds of silent carrier. Such was the value and interest generated by GB3IGY thoughts soon gathered pace for introducing two more beacons in the Cornwall and Scotland – as was the widespread support to resurrect the Kent beacon to continue propagation studies and use it as a frequency reference. By the tail end of 1959 the RSGB gained agreement to reinstate a permanent beacon on a BBC managed site and the obvious location of the Wrotham Hill transmitting site (only 6 miles E.S.E of Well Hill) was accepted in February 1960. Work to reinstate the beacon continued throughout 1960 with the deployment of a 5 element ruggedized J-Beam Yagi antenna mounted on the Wrotham mast 180 feet above ground, directed towards the North (later N.W.). Some delays ensured due to problems with designing a new reliable automatic programmed keyer unit – but with these overcome, a surplus Plessey PT15A transmitter with 50W output (200W e.r.p) was added to complete the set up. In December 1960 the beacon was reactivated using a new callsign GB3VHF. 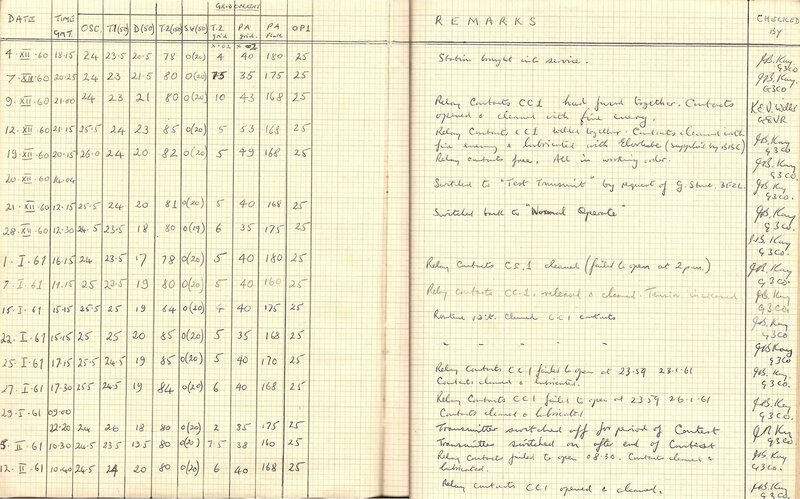 Throughout 1961 and ‘62 propagation studies were carried out with detailed measurements made between Wrotham and the J-Beam factory in Northampton. Reception reports were also encouraged and acknowledged with a GB3VHF QSL card from the RSGB’s VHF committee. The frequency stability of the transmission was also monitored during this period by the BBC’s monitoring station at Tatsfield in Kent and found to be typically within a 1.5 KHz tolerance. Towards the end of 1962 the beacon transmitter was overhauled after approximately 15,000 hours continuous use without a failure. But fate was soon to intervene early in 1963 with a fault developing with the antenna system brought on by the severe winter weather conditions. With the beacon off the air and winter snow making repairs impossible, the beacon was temporarily relocated to Shooters Hill, 15 miles N.W. of Wrotham in S.E. London using a transmitter loaned by the Pye Telecommunications Radio Group. The temporary beacon remained at Shooters Hill till July 1963 when service was able to recommence at Wrotham using fsk modulation. Other UK VHF beacons joined GB3VHF in the early to mid 1960’s with GB3CTC in Cornwall, GB3ANG and GB3LER in Scotland, and GB3GI in Northern Ireland. The beacons with frequencies and modulation characteristics were regularly listed in the RSGB Bulletins of the period, although GB3VHF was always given special preference as the “RSGB’s beacon station” and was accompanied with its frequency deviations monitored by the BBC, placing it as the prime reference beacon for the UK. More changes to GB3VHF began in the early 1970’s with the move to a solid state keyer and a change from the valve based technology to a completely transistorised beacon. In 1974 the frequency was changed to 144.150 MHz as part of a pan European harmonization initiative. The frequency change resulted in the beacon being off air for a few months while crystal oscillator changes from 4 to 72.075 MHz were made during 1975. A further round of changes were instigated as the 1970’s drew to a close, with the beacon keeper Brian Bower G3COJ introducing a microprocessor controlled keyer built by Richard Russell, G4BAU, with Morse code for the callsign and RTTY for a detailed location identification. 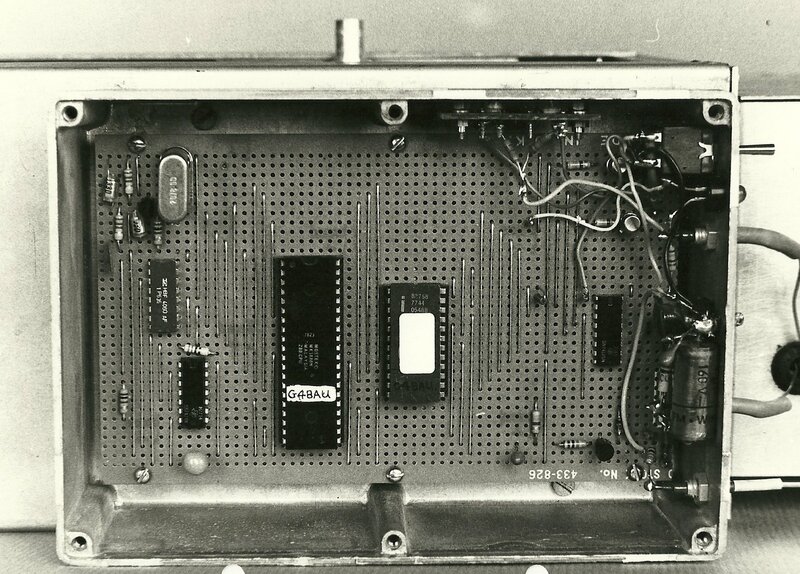 This keyer was based on a Z80 microprocessor and to eliminate the possibility of 'crashing', the keyer used no RAM at all, and the processor was actually reset at twice the RTTY bit rate which was 45.45 baud - it was effectively rebooted about 90times a second!. This was possible because the Z80's registers (at least in the CMOS version) preserve their contents through a CPU reset so it was possible for the code to 'continue where it left off'. This change of hardware also coincided with an IARU instigated frequency change which resulted in a move to 144.925 MHz. The 1980’s brought more change with the replacement and upgrade of the Wrotham mast. The opportunity was taken while off air to replace the 20 year old 5 element Yagi with two phased three element Yagis beaming 288 and 348 degrees. Higher specification feeder was also used, fortuitously acquired as surplus from the move of the BBC Radio London transmitter from Wrotham to another site. Since the 80’s the beacon had shared its location with the UHF repeater GB3NK. 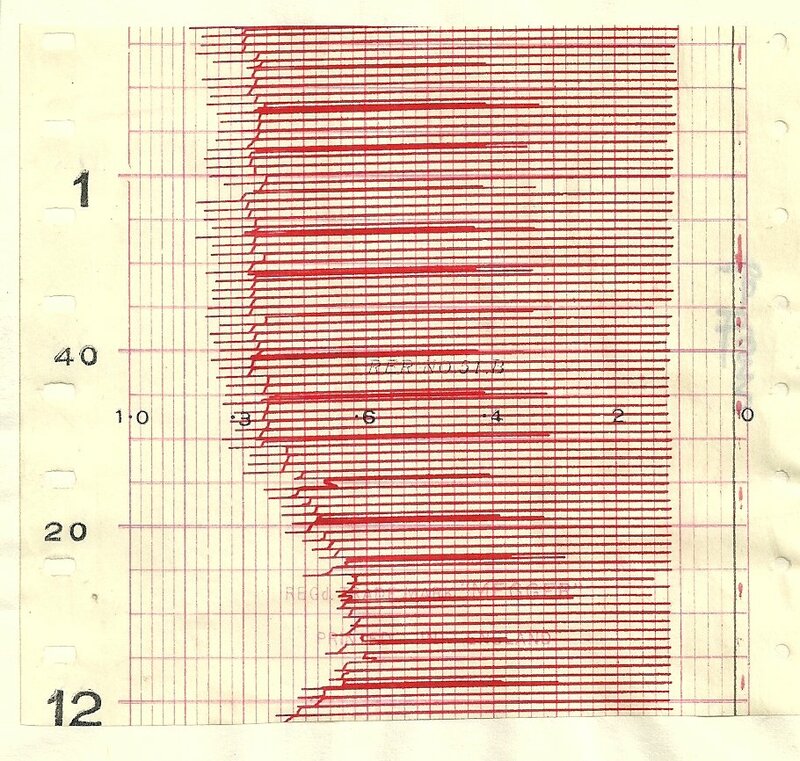 When first operated, some problems arose with the beacon’s third harmonic on 70 cm affecting the repeater. Brian Bower G3COJ solved the problem with the addition of a double stub filter, after which the two systems worked happily side by side until the repeater had to move site in 2002 due to increasing site rental financial pressure. In the mid 90’s Brian Bower retired from the BBC and the beacon keeper passed to Bob Mersh G8JNZ who was also the repeater manager for GB3NK. By this time the beacon was becoming somewhat old in the tooth and Chris Whitmarsh G0FDZ was called upon on several occasions to keep the unit going. Some of the components used in the beacon were unobtainable and thoughts were directed towards a replacement unit. At the end of the 90’s the band plan changed again and the frequency was changed to the current 144.430 MHz, and at the same time the micro-processor based keyer was replaced with an EPROM keyer just giving the callsign and locator. The beacon continued to provide service, but keeping the beacon accurately on frequency was becoming more and more difficult to achieve. In the early part of the new century, Bob Mersh G8JNZ became very ill with cancer, and sadly passed away in May 2003. Shortly before he died, he passed on the beacon keeper’s job to Chris G0FDZ. Chris continued to maintain the beacon, but realised that a replacement beacon was overdue. Andy immediately started on a new design incorporating one of the latest technology direct digital synthesiser (DDS) devices at 72 MHz (the frequency would be doubled to 144 MHz) locked to a Jupiter global positioning satellite (GPS) receiver. The DDS can be programmed and the final unit would be able to produce on/off Morse and now WSJT JT65B mode as well as producing carrier phase changes as part of its keying cycle. The use of GPS also enabled a precise keying cycle, so that at any particular time the listeners knew exactly what the beacon was sending. Together with a new RF PA and post-DDS crystal filtering produced by Sam G4DDK and a new PSU designed by David Bowman G0MRF, the newly integrated beacon was finally assembled by Chris G0FDZ and put on the air in February 2006. The response from the users was immediate and very positive indeed, and the new technology and facilities were probably a world first for amateur beacons. The beacon continued in continuous service, on 144.430 MHz at Wrotham until 2010 when forced to close due to financial pressures brought on by site fee increases and withdrawal of support funding and the increasing difficulty of maintenance access at the now commercially owned Wrotham site. However, this was not the end and in April 2010 the beacon had been relocated to a British Telecom site at Fairseat, Kent (4 km E.N.E. of Wrotham). For some time thought had been directed towards the possibilty of propagation study using both GB3VHF and a new beacon on three times the frequency at 432 MHz, and using similar ERP, antenna types and antenna directions to that used for GB3VHF. That possibility is now a reality as since June 2016, GB3UHF has joined its sister beacon to provide this new service. There is still much to discover on VHF and UHF long distance propagation and it is hoped that the two beacons will help to provide new data. In January 2018 the GB3UHF driver PLL hardware was replaced with New Generation Beacon DDS & VCO/PLL units, thus ensuring that the beacon offers the most up to date facilities that can easily enable changes in the future to cater for new modes and keying pattterns. The spirit of amateur radio and those forward thinking instigators of IGY lives on and it's hoped that the beacons will continue to be in safe hands for many generations to come.